Description: Lorne R. Zelyck explores the influence of the Fourth Gospel on the extra-canonical gospels from the second and third centuries CE, and evaluates how these other gospels used the Gospel of John. First he provides a succinct demarcation of the extra-canonical gospel corpus and introduces a critical methodology for measuring the influence of the Fourth Gospel. Then he measures its influence on the narrative, sayings, and dialogue/discourse gospels. 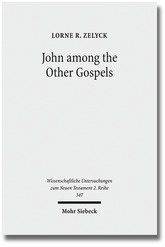 Lastly the author concludes that the majority of extra-canonical gospels indicate a probable or plausible measure of influence from the Gospel of John: they have lengthy and shorter parallels with the Fourth Gospel, quote and exegete this work, and provide traditional interpretations of the Fourth Gospel that are evident in other early Christian literature. Citation: Jason Sturdevant, review of Lorne R. Zelyck, John among the Other Gospels: The Reception of the Fourth Gospel in the Extra-Canonical Gospels, Review of Biblical Literature [http://www.bookreviews.org] (2014).